Human perception demonstrates strong ability to understand and interpret human face, such as the recognition of human identities and facial expressions. This project aims at designing face recognition algorithms and systems to bridge the gap between computer vision and human vision. We are working on various topics, including face sketch synthesis and recognition, face recognition based on subspace learning, graph-based face recognition, and face recognition using deep learning. * PCA, LDA, and Bayesian analysis are the three most representative subspace face recognition approaches. In the topic of face recognition using subspace learning, we show that they can be unified under the same framework. We model face difference with three components: intrinsic difference, transformation difference, and noise. The framework is constructed by using this face difference model and a detailed subspace analysis on the three components. Based on the framework, a unified subspace analysis method is developed using PCA, Bayes, and LDA as three steps. A 3D parameter space is constructed using the three subspace dimensions as axes. Searching through this parameter space, we achieve better recognition performance than standard subspace methods. Q. Yin, X. Tang, J. Sun, IEEE Conference on Computer Vision and Pattern Recognition (CVPR), 2011. Handling intra-personal variation is a major challenge in face recognition. It is difﬁcult how to appropriately measure the similarity between human faces under significantly different settings (e.g., pose, illumination, and expression). In this paper, we propose a new model, called “Associate-Predict” (AP) model, to address this issue. 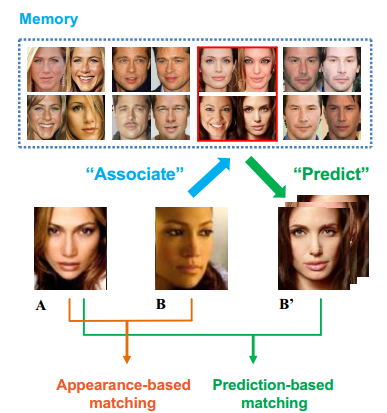 The associate-predict model is built on an extra generic identity data set, in which each identity contains multiple images with large intra-personal variation. We present a novel approach to address the representation issue and the matching issue in face recognition (veriﬁ- cation). Firstly, our approach encodes the micro-structures of the face by a new learning-based encoding method. Unlike many previous manually designed encoding methods (e.g., LBP or SIFT), we use unsupervised learning techniques to learn an encoder from the training examples, which can automatically achieve very good tradeoff between discriminative power and invariance. Then we apply PCA to get a compact face descriptor. X. Wang and X. Tang, IEEE Transactions on Pattern Analysis and Machine Intelligence (PAMI), Vol. 26, No.9, pp. 1222-1228, 2004. PCA, LDA, and Bayesian analysis are the three most representative subspace face recognition approaches. In this paper, we show that they can be unified under the same framework. We first model face difference with three components: intrinsic difference, transformation difference, and noise. A unified framework is then constructed by using this face difference model and a detailed subspace analysis on the three components. X. Wang and X. Tang, International Journal of Computer Vision (IJCV), Vol. 70, No. 1, pp 91-104, 2006. Subspace face recognition often suffers from two problems: (1) the training sample set is small compared with the high dimensional feature vector; (2) the performance is sensitive to the subspace dimension. Instead of pursuing a single optimal subspace, we develop an ensemble learning framework based on random sampling on all three key components of a classiﬁcation system: the feature space, training samples, and subspace parameters. Fisherface and Null Space LDA (N-LDA) are two conventional approaches to address the small sample size problem.